"These grilled chicken sandwiches are mouthwatering! Great for backyard get-togethers." In a small bowl, combine sliced avocado and lemon juice. Add water to cover; set aside. Preheat an outdoor grill for high heat and lightly oil grate. Heat butter in a large heavy skillet over medium-high heat. Saute the onions until browned and caramelized; set aside. Season the chicken with salt and pepper. Place on grill, and cook until no longer pink and juices run clear, about 5 minutes on each side. Place buns on grill just long enough to toast them. 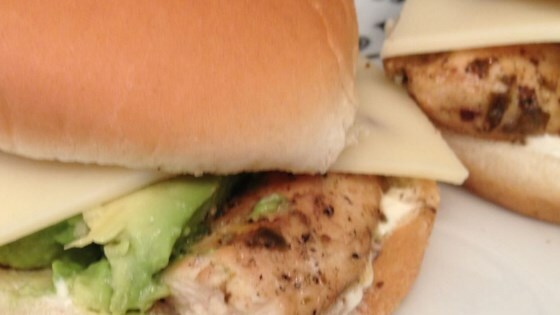 Spread buns with mayonnaise to taste, then layer with chicken, caramelized onion, provolone and avocado. I love the carmelized onions on top! I gave the avocados a light mash just to make them easier to eat.